I am not a Vegan but I do know that many vegan recipes will leave out the crap, and by crap I mean dairy. This recipe is great with traditional romaine lettuce or by doing a kale Caesar salad. Throw in vitamix or blender until smooth. You can also add this all to a food processor and get the same results. Make your flour mixture with spices. begin mixing in the liquid. this is the time you may need a little more or less depending on the type of flour you chose. Once you have a consistency almost like pancake batter, begin dipping your cauliflower pieces in the batter. Place coated cauliflower on a lined or greased baking sheet. Place in the oven on 425 for 10-15 min. Remove from the oven and place your buffalo sauce on the cauliflower. Place back in the oven for another 10 min until you begin to see or feel it is crispy. Remove and allow to cool. Enjoy! When my schedule allows on Wednesday night the kids and I do a Facebook live recipe. Addi enjoys helping me out and it allows me to show that I do teach healthy eating, but don't have time to blog recipes since I am with clients and my kids all day. These videos stay up on my business Facebook page, Sarah Moore Health, but I am also going to start sharing them here. I hope you enjoy, make them, share, tag and have fun with getting healthy! Remember avocados come in different sizes, adjust the flavor accordingly. Open avocados remove seed scoop into a food processor. Add remaining ingredients. You might have to adjust cacao powder and stevia to your taste preference as you blend. You may want it darker or sweeter. Place in whatever cute dish you would like, top with goji berries and cacao nibs and dig in! So today in Middle Tennessee its a snow day. This doesnt mean much for me as far as the kids go because we homeschool. It does however having me wishing I was living in California. I love the beauty of snow but do not like to have my freedom taken away, if that makes sense. But, what can you do so I started making yummy food. 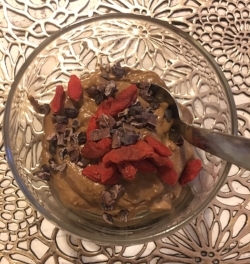 I juiced turmeric and ginger for shots and made my raw kale salad, and now I am sharing with you the vegan chocolate mousse that I like that is also sugar free! Place all ingredients in the mixer of choice and blend. You may have to scrape the sides a couple times or add more nut milk if you would like it smoother. Place in fridge until cold throughout, then eat! If you are not worried about sugar you can use honey or pure maple syrup instead of stevia for a nice flavor change. Now since my pictures are so fancy ( sarcasm) I hope it shows you how yummy this is. Really think chocolate gelato with a hint of avocado.